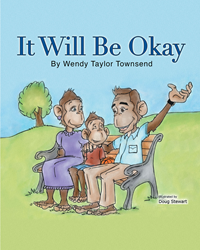 “It Will Be Okay” from Christian Faith Publishing author Wendy Taylor Townsend is the story of a little monkey’s struggle to understand why his father cannot do things with him as he battles illness. In gentle and accessible terms, Momma Monkey explains what is happening, and offers hope and reassurance during a scary and sad time in the life of her family. “It Will Be Okay”: a poignant story of love and encouragement that no matter how bad it may seem, there is comfort in the knowledge that everything will be okay. “It Will Be Okay” is the creation of published author Wendy Taylor Townsend, who lost her own husband to cancer in 2001, leaving their young children without a father. Her love of children’s literature inspired her to write this book in the hope of helping children cope with the devastating loss of a parent or other loved one. Published by Christian Faith Publishing, Wendy Taylor Townsend‘s new book is a gentle story of hope and encouragement for anyone coping with the death of someone they love. View a synopsis of “It Will Be Okay” on YouTube. Readers can purchase “It Will Be Okay” at traditional brick and mortar bookstores, or online at Amazon.com, Apple iTunes store, Kobo or Barnes and Noble. For additional information or inquiries about “It Will Be Okay”, contact the Christian Faith Publishing media department at 866-554-0919.